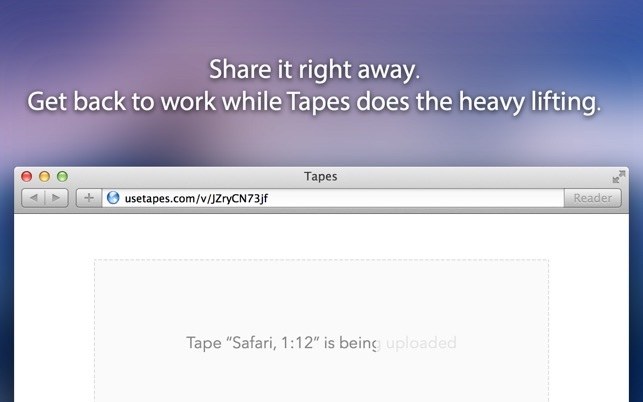 Tapes is a screencast app living in your menu bar. 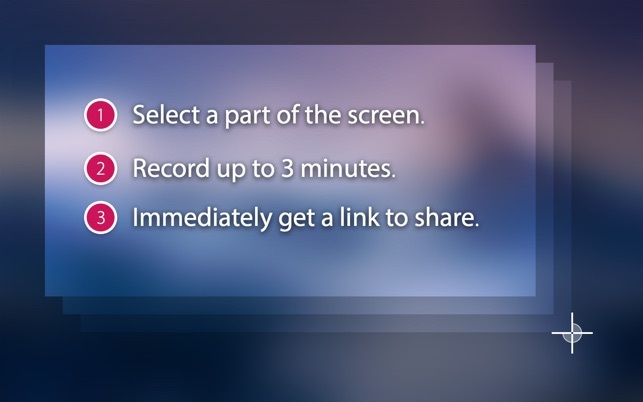 Select part of the screen, record up to 3 minutes of video and instantaneously get a share link. Don’t type a long email to your team with static screenshots, use Tapes to show them what you accomplished. Don’t describe over the phone how to add a printer to your parents’ Mac, send them a tape so they can see for themselves. Tapes is simple to use and super fast. There is no waiting for the upload, the link is added to your clipboard immediately so you can share it over instant message, email or via Twitter. Because Tapes is designed for communication through short screencasts, there is a limit of 60 minutes to record in last 30 days. Our global statistics say that 98% users never reach 30 minutes recorded per month. The limit exists to make Tapes economically feasible and prevent abuse. You can also increase your limit by sharing a referral URL, it will give you 15 more minutes. This update brings full support for macOS Mojave and Dark Mode. Easy Screencasting - but limited to 60min a month. A friend sent me a screencast made with Tapes and I was impressed by how nice it looked. I quickly purchased it. It wasn’t until I was looking into the preferences and saw that you are only permitted 60 minutes per month, and each screencast is limited to 3 minutes. While this will suffice for most folks, I was hoping to use it to support users, and find this to be a bit limiting for a $10 product. There is a way to ‘earn’ more credit per month by referring folks, but that’s a bit of a hassle, and I’d rather have the opportunity to 1) Delete a screenscast to recover the minutes. 2) Option to purchase more. 3) Have them make the threshold higher than 60 minutes. Other than the time limitations - it’s a very nice little app. * you could record tapes longer than three minutes (although the limitation has allowed me to title my training videos “X subject in three minutes,” which is great); there are times when even an extra 30 seconds would be beneficial, and I’ve had to re-record a couple of things where waiting for load times bumped me just over the three-minute threshhold. * you could do something with the final product other than link to it from the Tapes website; I have in the back of my head the possibility that the work I’ve done on the (admittedly few) Tapes videos I’ve made so far will go up in smoke if Pilot decides to cease development of the app. * there’s another comment about wanting embed codes, and that’d be super-handy too. Minor gripes though; this works great and it’s been well worth the purchase. I use Tapes ALL the time. I adobre this app and use it constantly. I use it to record quick videos for friends and family, demonstrating how to use a particular app or website. I also use it when sending bug reports to app developers, or when seeking tech support from developers. It’s one of my most valued tools.